Toyota recalls 138,000 cars in the UK | What Car? Toyota is recalling more than seven million vehicles globally, with affected UK models including the Auris, Corolla, RAV4 and Yaris. The recall includes around 138,000 cars in the UK, and has been issued due to faulty window switches. Toyota says the problem, which can cause both front electric windows to fail, has not caused any accidents, injuries or deaths. 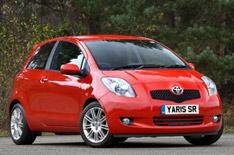 UK cars affected by the potential problem are Auris, Corolla, RAV4 and Yaris models built between September 2006 and December 2008. Globally, the models being recalled are the Auris, Camry, Corolla, Highlander, Matrix, RAV4, Sequoia, Tundra, Vios, xB and xD produced between 2005 and 2010, and certain versions of the Yaris. Owners will be contacted by Toyota within the next six weeks to find out if there is a problem with their vehicle. If detected, the fault will be remedied at no charge to the owner.